For the Application of Labels & Logos. 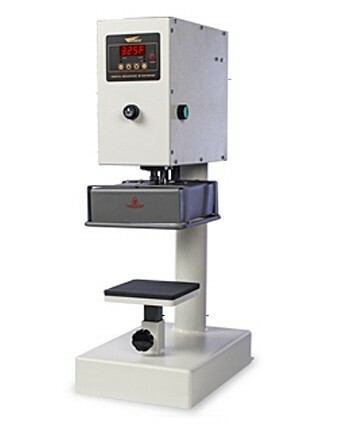 Built with the superior craftsmanship Insta is known for, the Model 909 Digital Single Station heat press machine has been specifically designed for the rapidly growing heat transfer label industry. 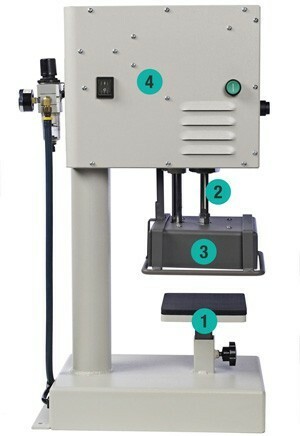 This automatic heat press machine is air operated to help prevent operator fatigue and promote consistent production speed. Its 6”x6” platens lend itself to the application of tagless labels, as well as, logos & small graphics. Always consistent in its results, the Model 909 is used for its high speed application capability and its reliability under 24/7 use. The Model 909 has been strategically designed to generate & evenly distribute tremendous pressure throughout the entire platen. And, its cast-in tubular heating element heats the metal from within, to produce constant and long lasting heat. A successful heat transfer application requires 3 key elements to work in tandem– time, temperature & pressure. The Model 909 has mastered those elements and gets the job done every time. Its lower platen can be easily lifted out and replaced with a smaller 2.5”x2.5” lower accessory platen for the application of small tagless labels. Machines made from cast metal are considered to be the highest quality and are strong enough to withstand heavy use without warping or bending. The 909 is extremely durable and, if cared for properly, can last up to 25 years. 6”x6” upper and lower platens. Fully adjustable pneumatic pressure control. Built in cycle counter displays up to 9999 applications. Integrated digital controller which features controls for time, temperature (Fahrenheit or Centigrade) & cycle counter. Lifetime warranty on upper heating element. One year on parts & 90 days on labor.